Letter in regards to the printing of some booklets about the Berry Schools. Mr. Webb asks if Miss Bonner wishes to place an order for the booklets as well as the Highlanders or if the booklets are to be included in the Highlander. He also gives her an update on the health of Mr. Martin and hopes that she has fully recovered from her automobile accident. 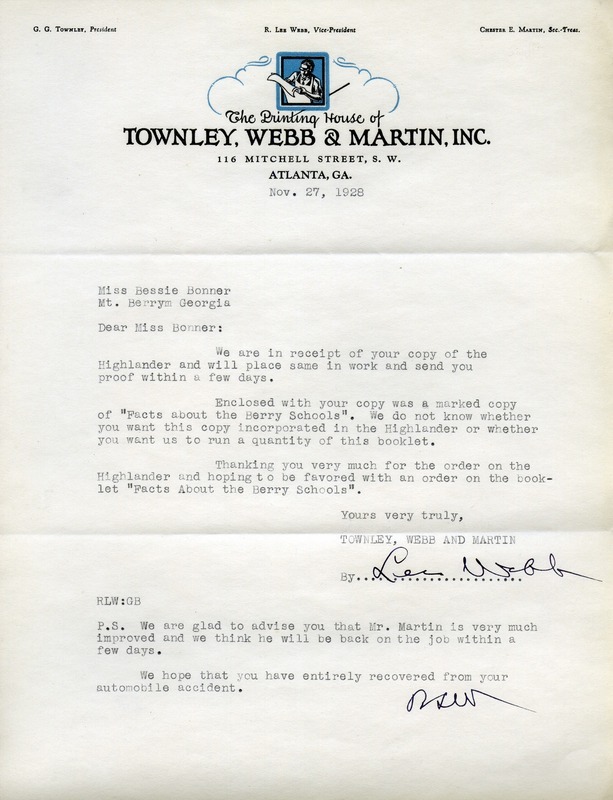 Lee Webb, “Letter to Bessie Bonner from Lee Webb.” Martha Berry Digital Archive. Eds. Schlitz, Stephanie A., Chelsea Risley, Allison Moore, et al. Mount Berry: Berry College, 2012. accessed April 22, 2019, https://mbda.berry.edu/items/show/9141.